“LIFE is an adventure….Just explore it…!! !” True words…. Trekking is one such adventure to know about nature and dig out some unknown things. Now, let me begin how it started……Trekking has always been of keen interest for me(Or my passion). 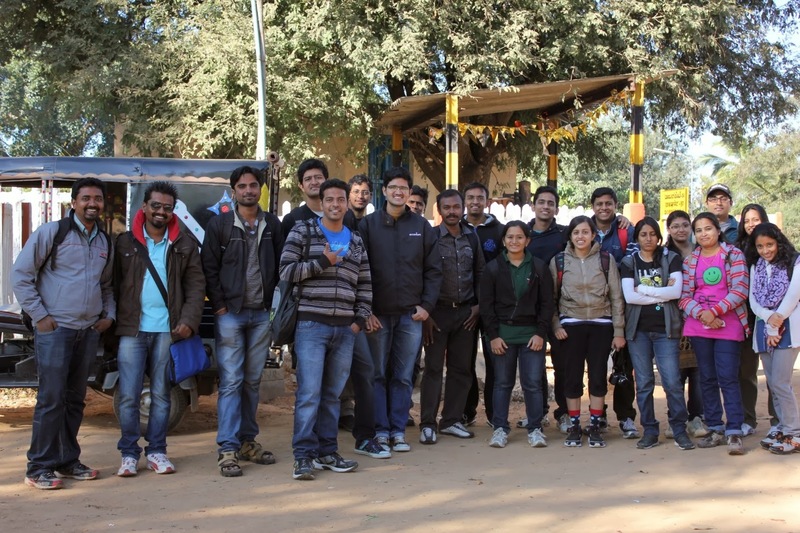 Searching through Google and some friends, I gotta know about BTC (Bangalore Trekking Club). Thanks to Apoorva and Guru for taking things seriously and getting my name registered for BTC. It was our 1st trekk with BTC and we were excited. Completely unknown people and a day to watch for. 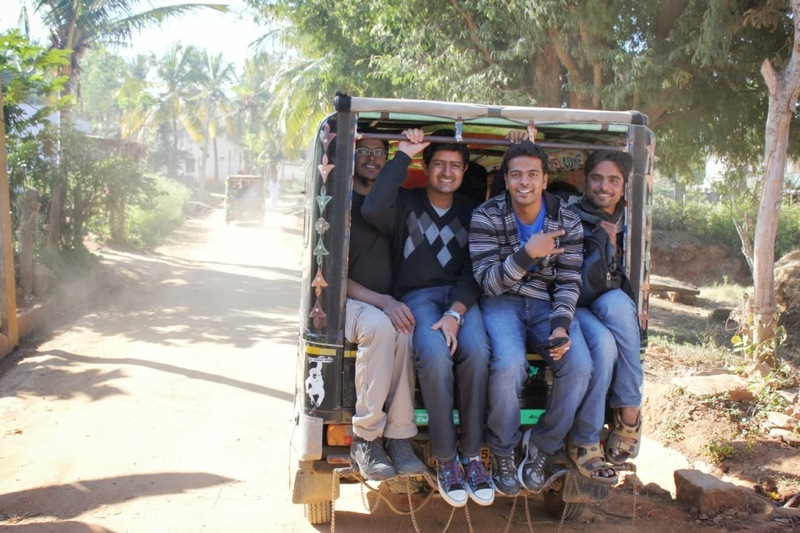 We received mail from Sangamesh (Organizer) along with the list of candidates for the trekk. 7:00am we arrived at Bangalore Central Railway Station waiting for other people to arrive. Met my known friends and the Organisers. We boarded the train and had a short introduction with each other. We started to mingle and share our college memories with laughs n gags. Anthony introduced himself and his journey with BTC and hence tried to indulge with us as well. 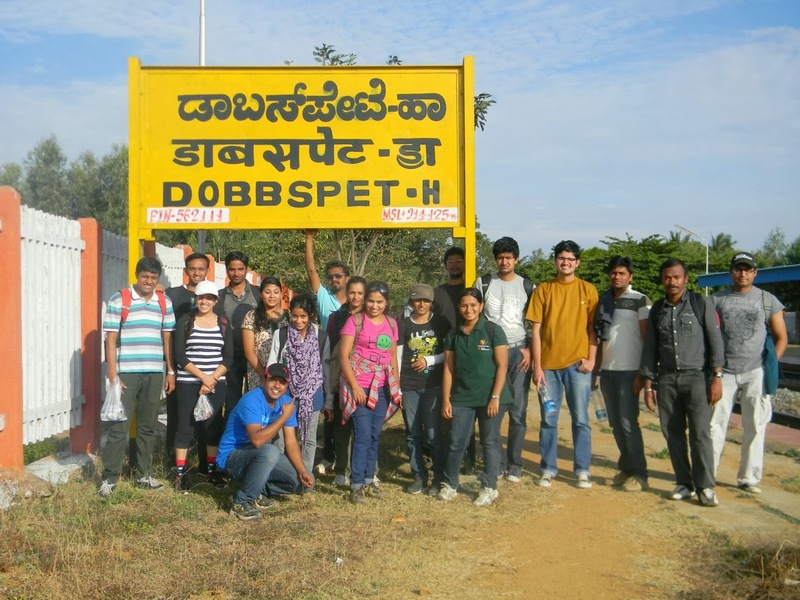 We reached Dobbaspet (9:15am)station and took an auto till the main city. Filled our tummy with “Tatte-Idli” (ummmmm…..wo swaad kya batau) and took Rice-baath (parcel) for lunch. Fully energized ready for the tough tasks ahead…..!!! And here begins our journey through the rocky terrain and steep slopes. Climbed a few steps and reached a point where we needed support rails to climb since it was slippery and steep. Within no time all the new faces had become the familiar ones and trekking became more and more swift with the fun we started having on the way. 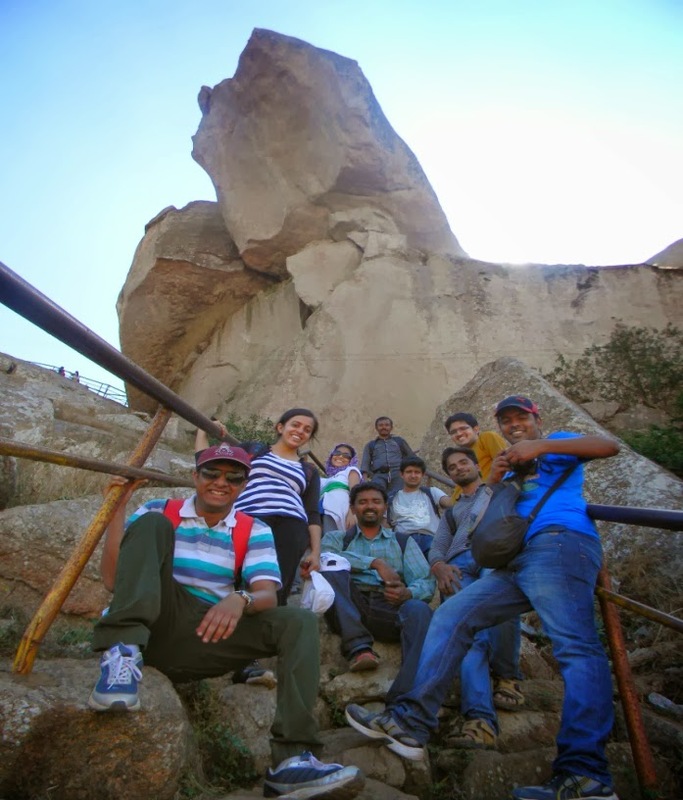 Since most of them were 1st time trekkers, we took a little while to move forward. But later even they got momentum and we proceeded rapidly. Had “limbu-paani” in between to add energy boosters. Took rest at times when it was too tiring. But our peak point was still a long way to go- so we moved on…………..!!!! The freaky mOnkeys…..de Scare and Trouble u alot……..!!! I can’t forget this- my friend Guru was havin glucose when monkey came in and snatched it from his hand. Here’s one of the rarest pics you will ever get to see……!!! The glucose buoy……. The Holy part of it……!!!!! On the way, you get many temples of Shiva,Durga. One interesting thing about this hill is that it looks like Nandi from east, Ganesh from the west, Linga from the south and like a cobra with an open hood from the north. I could not figure it out though. We came across “Olakal Teertha” (holy water inside the stone). There is a small hole inside the stone and it is believed that only people with good deeds can touch the water inside. So everyone gave a try for this and many found in first attempt. Few with short hands could not touch. Don’t know whether it only works for people with long hands or it really has some significance. U must try your luck though……..!!!! On the way you come across Shiva-Parvathi temple. The trek till here is normal. U can take some rest here since the actual difficulties start after this. Although looks moderate for frequent trekkers…….!!!! We reached the peak by 12:00pm exactly after one and half hour trekk quite exhausted due to the heat of the sun. Thanks that we carried enough water to manage the stuffs. 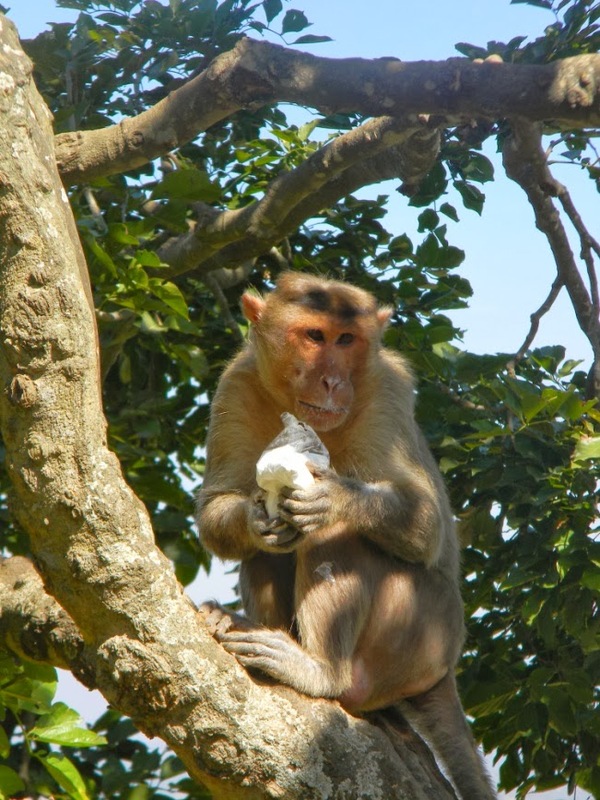 Although we could not eat the food we had packed due to the fear of monkeys. 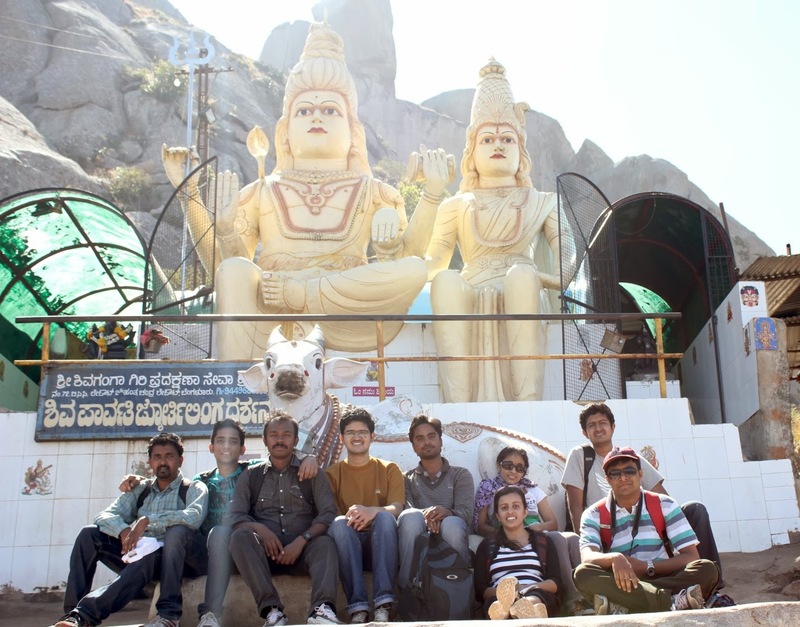 The view from top is really worth watching and NANDI at the top its attraction. 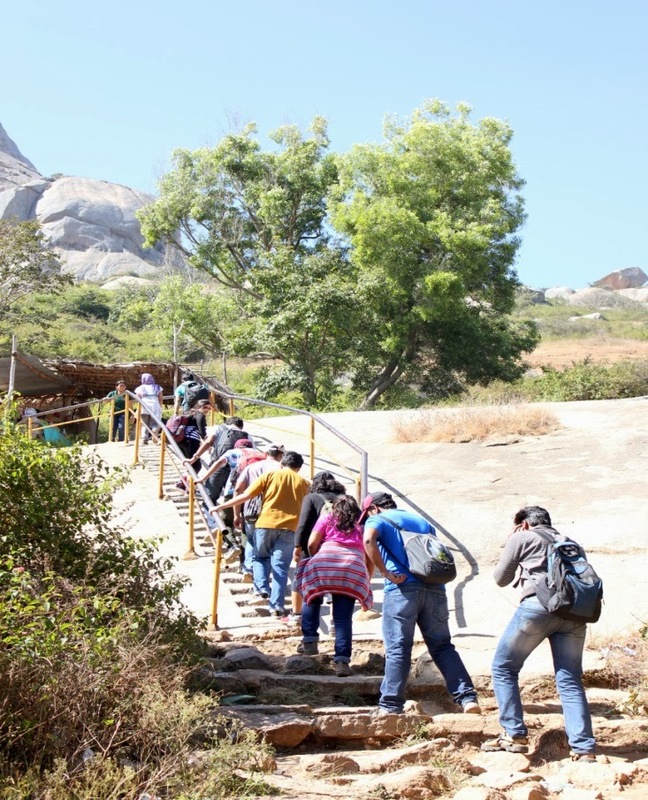 It is also called as SHANTALA point which is about 500ft fall on the rocks - believed to be the suicide point of Hoysala King Vishnuvardhana’s wife Shantala. There are 2 bells tied on the other side of the Cliff too- which you cant touch. We spent some time taking some snaps up there. Feeling the cool breeze and enjoyin the beauty of nature. It’s wonderful to look at the world standing at the top of the HILL. We finally left by around 2:00pm since we had to catch the train @ 4:00pm back to Bangalore. Last moments with the group……….!!!! All were exhausted since it takes lots of pain to climb the steps and bear the heat too. But had a nice time in all. Not to forget- We gotta celebrate someone’s bday who had come there n asked us to join too. He should feel luckky that he had BTC guys’s to accompany with the CAKE. Although we had our own CAKE since it was BTC’s birthday event which was cut at the end. Finally we had Lunch at the railway station along with group pic and left Dobbaspet @ 4:20pm. My first trek with BTC and many memories to carry with. Special thanks to our Organiser- Sangamesh for his support with smiles and jokes and for keeping all united thoughout the trek.